I’ve been pondering a visit to Hopgood’s for some time now. I often stay downtown so the thought of a long drive, expensive and smelly cab or an onerous TTC excursion usually turns me off and I end up settling on something a little closer. However, a few Mondays ago I was driving to Toronto from London right around dinner time and took advantage of the location plus buck a shuck oysters by popping in before checking into my hotel for the night. Hopgood’s has received constant accolades since opening a few years back. It’s theme is east coast fare with a Toronto twist. It goes without saying that it boasts a ocean-centric menu with a bit of poetic licence. The menu is smallish but complemented with a number of blackboard specials meant to highlight seasonal ingredients. I grabbed a seat at the bar right in front of the oyster shucker. He was busy cracking open the joints of 4 or 5 different types and throwing them on trays of ice. Oysters are a most interesting culinary phenomenon. There are dozens of species of oysters and each have a distinct profile. Much like wine, pundits post comments about the bouquet and balance of the tasty mollusks. There are heated debates about proper condiments; horseradish, lemon and mignonette seems to be holy trinity but it is not uncommon to see cocktail sauce and even blended scotch make it’s way on the list as well. In oyster world, there is also the east versus west coast battle which may be as heated as the music rivalry which has existed in the hip-hop/rap world since the nineties. Tupac and B.I.G were victims of drive by shootings in Las Vegas, Nevada and Los Angeles, California respectively. Tupac was hit four times in the chest, pelvis, and his right hand and thigh. B.I.G was also hit four times with almost an identical profile except for a shot in the back versus chest. Both reports noted that one of bullet hit the victim’s left testicle. Tupac died six days later in hospital while B.I.G died only an hour after the shooting. Neither case has been solved although much speculation still exists as to who the shooters were. Not surprisingly, names like Diddy and Suge Knight (and in the case of Tupac Biggy himself) come up, but the composite sketch of B.I.G’s shooter looks like The Fresh Prince’s Carlton more than any of the suspected hip-hop thugs. Back to Hopgood’s. As opposed to a skinny and cut West Coast Tupac and a heavy east coast Notorious B.I.G, oysters are the opposite. Atlantic oysters tend to be a bit smaller whereas Pacific are meatier. 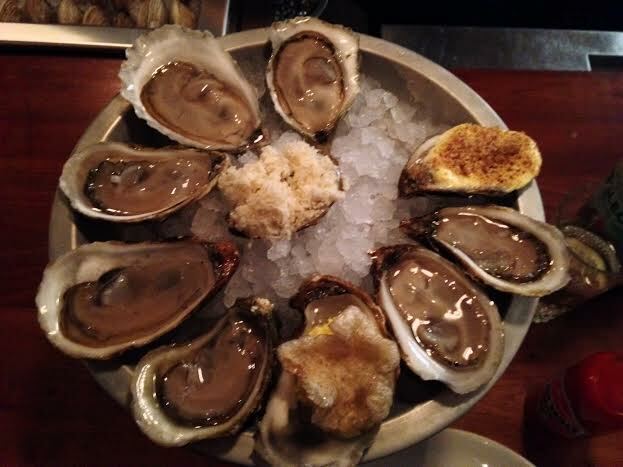 What I found impressive was the fact that there was no compromise in quality even though it was buck a shuck night. I have been to other places where the only option were rather measly and pathetic Malpeques . They did charge for condiments such as horseradish (and a rather interested egg/scapple combination (6 o’clock) which I quite enjoyed) but that still didn’t hinder the fact that they were a great deal. They did take some time to come and an apology came in the form of a free oyster topped with a torched parmesan sauce (2 o’clock) which gave it a nice baked oyster taste without compromising the integrity of the fresh oyster itself. While waiting for the oysters I ordered a winter derby (Elijah Craig Bourbon, Averna, Clementine Shrub, Lemon, Maple Syrup, Cinnamon & Pear Bitters) for $15. It was tasty cocktail and while a little on the sweet side, had a nice balance and richness which removed the temptation to shoot it while at the same time not being a meal in itself. 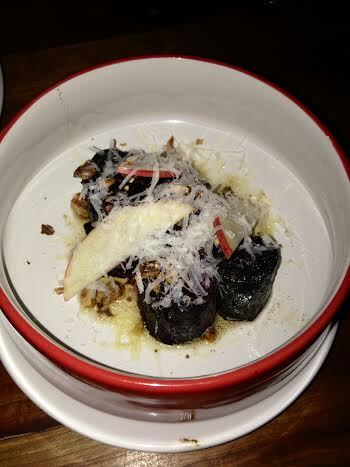 I went to the blackboard for my next dish which was beet greens served with brown butter and walnuts. The bitterness of the greens were harnessed somewhat but the sweetness of the butter and the walnuts glued things together with earthy contrast and crunchy texture. The apple added a needed freshness. I found it a very smart dish. 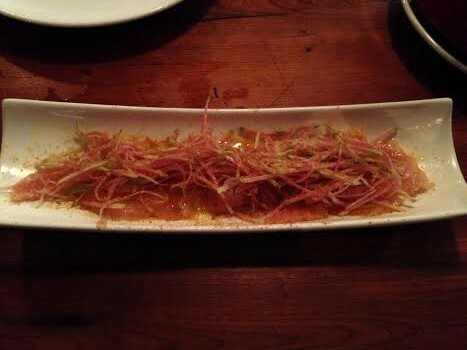 The blackboard also offered a tuna belly crudo which was garnised with a salad made of watermelon radish. It was safer than I expected. The tuna itself was fresh and delicious but there was a general lack of seasoning, acid and heat. In the end, I thought the fish and salad lacked cohesion as a single dish. 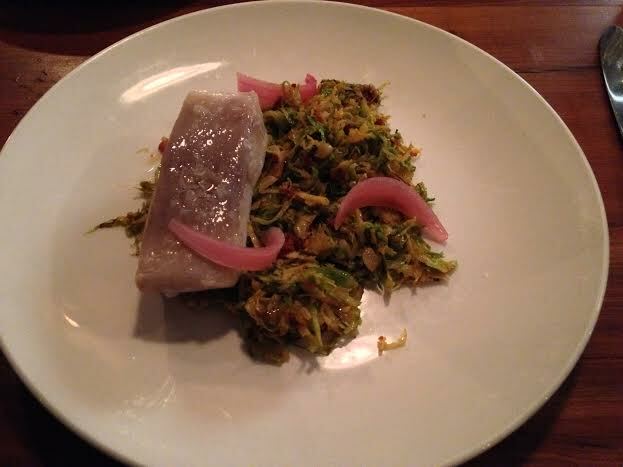 For the main course I stuck to the menu and ordered the sablefish with a n’duja and brussel sprout salad. I expected that a restaurant with great accolades which specializes in seafood would be able to nail a piece and sablefish and I wasn’t disappointed. What blew my mind was the salad. The crunch of the sprouts with the surprising heat (after all where are talking east coast) of the n’duja was unexpected. In fact, the fish was close to playing supporting actor to the sprouts but the fact it was perfectly cooked allowed it’s buttery richness to shine as the star on the plate. Since I was so impressed with the salad, I couldn’t help but turn to the blackboard and hope that the steamed scallops with n’duja was still available ( I should state here that like most specials, they are made in limited quantities and many of them had lines scratched through them as the night went on). It was a carbon copy of the sablefish; the beautifully presented (in shell) scallops were respectfully prepared and once again the sauce was spicy and delicious. I love playing with my food and I had fun dissecting the bivalves. There were long voids in between dishes and I found the service quite scattered and unorganized. Maybe it was the fact that the waiter taking care of me also had everybody else at bar, a few tables and was responsible for all the drinks. Although it was a Monday, it was busy and I think at times there was no rhyme or reason to the ways things flowed. 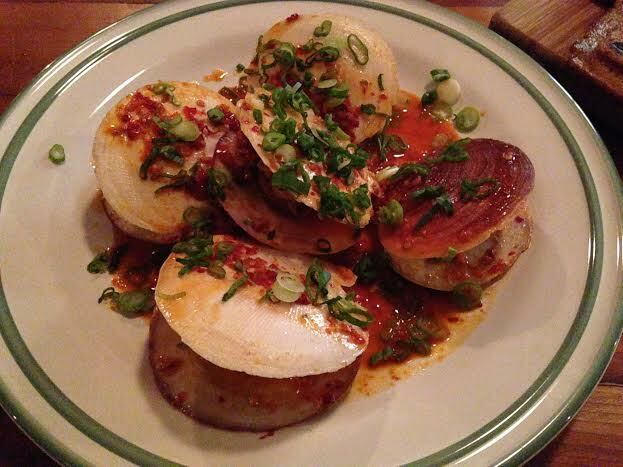 There is no doubt in my mind why Hopgood’s Foodliner has received the laurels it has since it opened a few years back. It takes the friendly cuisine of the east coast and urbanizes it to compete in Toronto’s progressive dining scene. Smart blackboard specials, perfectly executed proteins and surprisingly sauces highlight a superb menu. 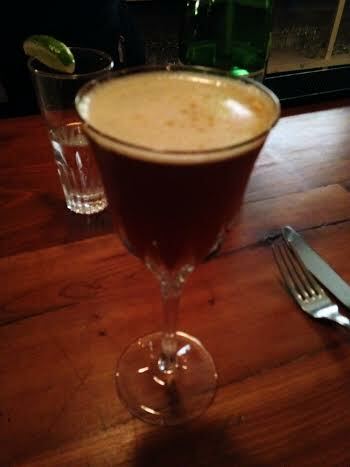 The cocktail list is pricy but smart by taking a number of tastes,flavours and boozes into consideration. The overall experience, however, was somewhat hampered by slow, inconsistent and confused service. Classic east/west rivalries such as the Celtics versus Lakers exist in sports. In the culinary world, celebrity chef and competitive brothers Bryan and Mike Voltaggio represent both sides of the United States (with west coast Michael winning the head to head battle on season six of Top Chef). I got thinking than a similar east versus west rivalry may add some spice to Toronto’s dining scene. Perhaps the line can be drawn along Bathurst which would nicely separate the bourbon- swilling Parkdale posse from the suit wearing Grey Goose-drinking downtown dwellers. Thankfully, the likelihood of shootings is minimal, but I imagine feuds could escalate into a night of a few Campari or Shiraz-fueled bitchslaps should things get out of hand. More likely would be the back and forth twitter banter such as “Hey Don Draper..how’s that Manhattan Tasting #westisbest” or “I drink AFTER working a 10 hour shift, not DURING one #plaidisbad”. The biggest question regarding Hopgood’s is since it’s an east coast restaurant on the west side, which side of the fence they would sit on? Perhaps it can assert itself as a neutral zone and a place where all can exist in harmony while doing oyster shots….just as long as you’re not in a hurry. Next Post What About Buk Chang Dong Soon Tofu When The Donger Need Food?